● Bingo players remain loyal to a handful of their favourite brands. ● Playtech is the driving force behind 7 of the 10 most popular bingo brands. ● The past year saw an increase in the frequency of play and average deposit values. ● More bingo players are playing online slot games. ● There has been a positive change in players’ attitudes towards bonuses because of fairer wagering requirements. Playing online bingo has long been considered a game more popular among women, despite the best attempts bingo brands to market it as a unisex proposition. 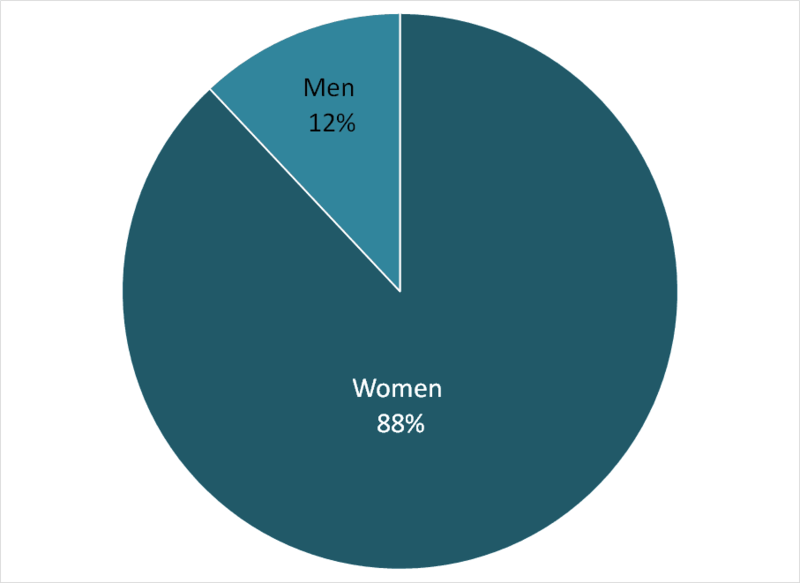 This still seems to be the case as the gender split between our survey participants this year was 88% female versus . This year’s results also show an increase in the number of older players for the first time in three years, with particular growth among the 55 and above age group. This year’s statistics on the number of brands players are members with showed a drop in the number of players opening accounts at multiple sites. Less than a third of players (28%) have memberships at more than ten brands, which could be a result of the decrease in the number of no-deposit welcome bonuses over the past 18 months. Over half of all players (57%) stated they had accounts with less than five brands, which suggests bingo players are generally loyal a handful of brands. Of those surveyed, 10% are members of just a single bingo site. Figure 3: How many bingo sites are you a member of? Amongst those surveyed, Sun Bingo came out as the most popular brand when respondents were asked who their favourite online bingo site was. The survey also found that seven of the top ten most popular brands are built on the Playtech bingo platform. Both of Gamesys’ major brands, Heart Bingo and Jackpotjoy also make the top ten, with tombola the only site powered by its own proprietary software, to make the list. 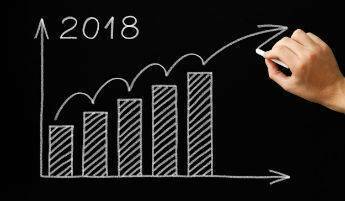 This year’s survey suggests that players are depositing more on average than they were in 2017. 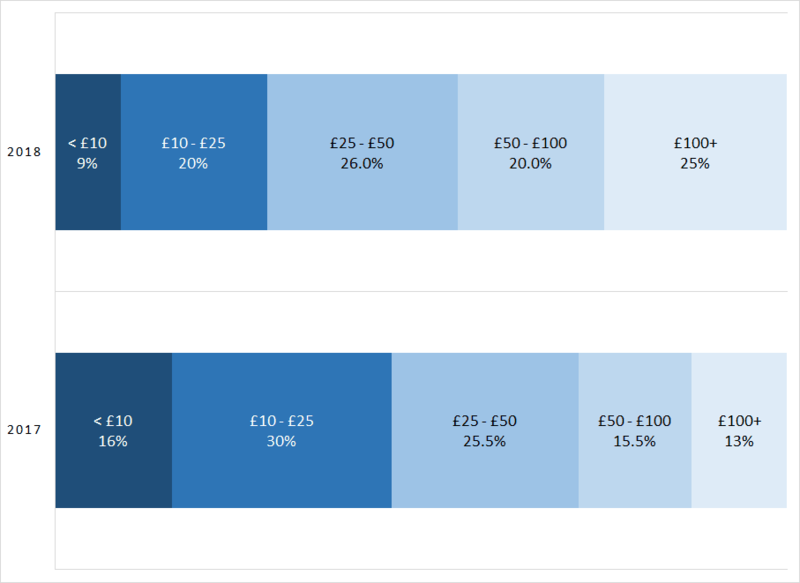 The number of players who said they deposit more than £50 per month increased from 54% to 71%, with a big increase in the number of ‘high rollers’ who deposit over £100 per month. In regard to which games they spend the most money on, bingo games came in first, with slot games a close second. This is no surprise given the long established affinity towards slots from bingo players, which extends even into the land-based bingo halls. Table 2: Which games do you spend the most money on? 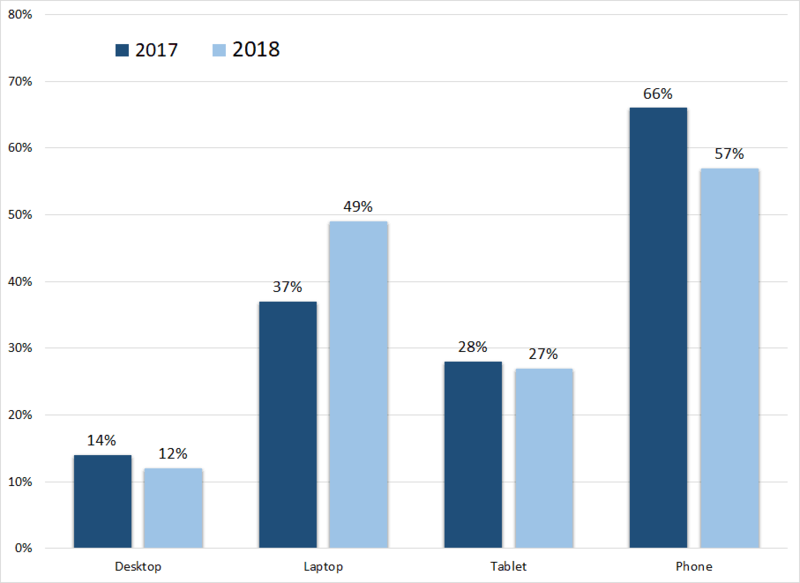 Two surprising results from this year’s survey were the drops seen in the total number of mobile device players, alongside a significant increase in those who play bingo on their laptop. 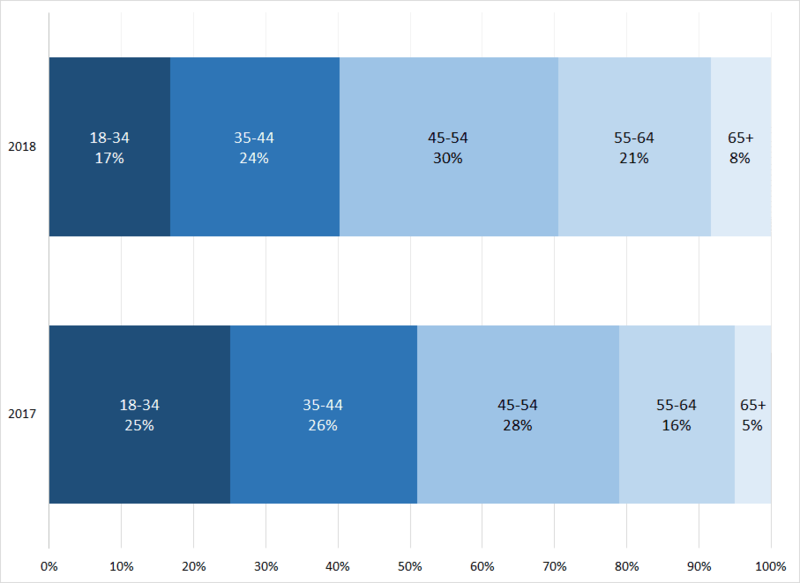 This, however, could reflect the demographic stats of those who participated in the survey (an increase in the 55+ age group). Our own stats for WhichBingo’s website traffic back up the widely held view that mobile continues to dominate the landscape, therefore we put the drop in mobile users as a potential anomaly in this year’s figures. Despite having a variety of devices to choose from, the survey indicates that most players still stick to just one type of device. Just over a third of players (36%) said they used multiple devices to play, which is almost the same results we saw in 2017 (35%). Of the players who claimed to play via mobile and tablet, the most popular way to play was via their mobile device’s web browser (46%) as opposed to downloading a dedicated app. Again, we saw a similar pattern in 2017 (49.5% web browser only). 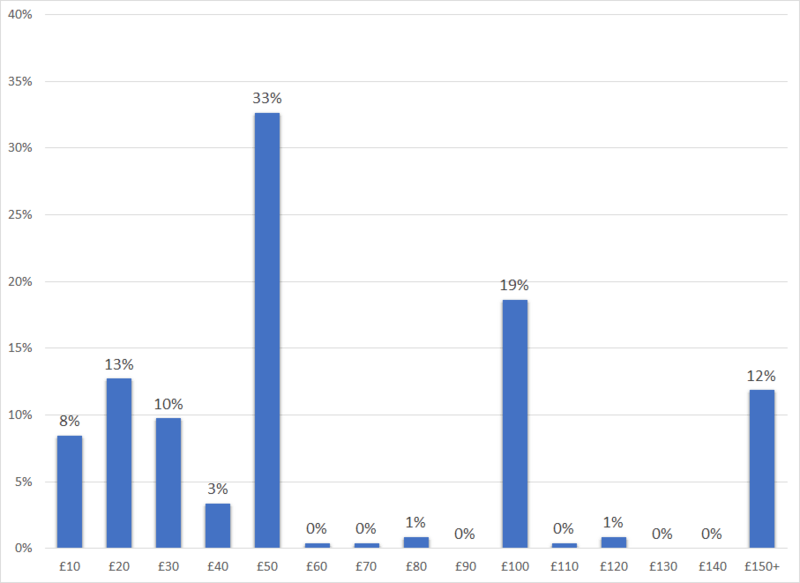 We asked players, “Is there an amount which you’ll only withdraw if you get above it?” The results were almost the same as last year’s survey, with the mode average of £50 being the most popular response. £100 was again the second most popular target for withdrawals. Overall, 86% of the players who answered this question gave a value of less than £100 which again shows that bingo players are happy to withdraw small winnings. We did however see an increase from 6% to 12% in the number of players who would only withdraw if they won over £150. The clear majority of players surveyed had made a withdrawal (89%). This amount was an increase from the 2017 survey (78%). 11% said they had been refused a withdrawal by a bingo brand, with incorrect or out of date ID being the most common reason why their withdrawal was denied. Last year we saw a big change in public opinion towards deposit bonuses, with 61% of players stating they would rather get no bonus at all if it meant they could withdraw winnings more easily. However, this year that figure dropped to 55%, which could indicate that deposit bonuses and wagering requirements overall have improved to such a point that players are more willing to claim them. This year’s survey results also revealed that 86% of respondents said they know what wagering requirements are, compared to 73% in 2017. These figures are indicative of an audience that is becoming more educated about the terms and conditions associated with online bingo bonuses. Online bingo is a regular pastime according to our survey, with 88% of players playing at least once a week, up from 79.5% when compared to 2017. We saw a big increase in the number of people who play bingo every day (44%), as well as a significant increase in the average length of time played during a session. It should come as no surprise that slots continue to grow as a popular game amongst online bingo players, which could be reflective of more brands putting slot titles front and centre in bingo lobbies and home screens. 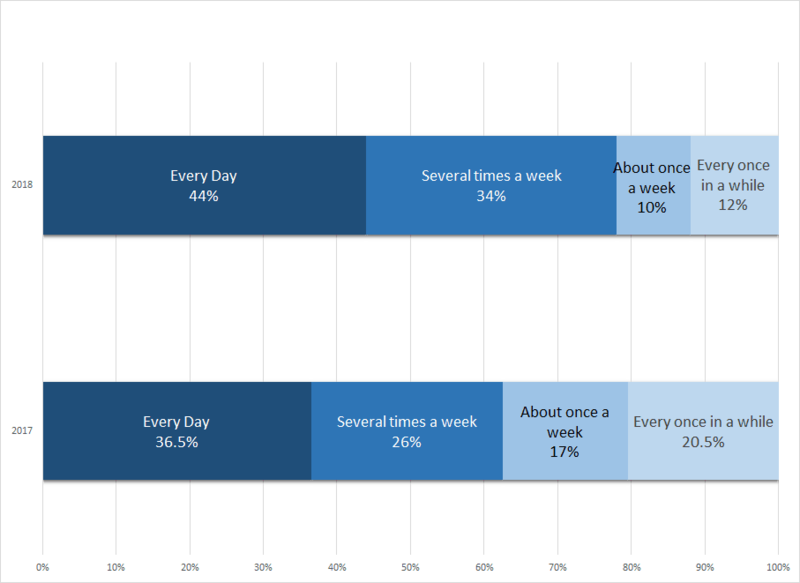 Figure 7: How often do you play online bingo? Table 6: How long do you play for in one sitting? Online bingo has long been perceived by the public as a form of entertainment rather than pure gambling, as reflected each year in our final question; “Would you describe yourself as a gambler?” For the third consecutive year, most players answered ‘no’ when asked this question. Table 8: Do you consider yourself to be a gambler?